Reduplicated form of *Fara [Proto-Polynesian, ultimately derived from Proto-Austronesian *pandan], indicating a plant reminiscent in some way of a pandanus. Proto Polynesian *Fara "Pandanus", especially Pandanus tectorius. These plant names are derived from from the Proto-Polynesian word root *fara (itself a reflex of Proto-Malayo-Polynesian *Pangdan), by doubling the root to indicate that something is like, reminiscent of, or a special form of what the source word refers to, and also by adding an additional element to further differentiate species. 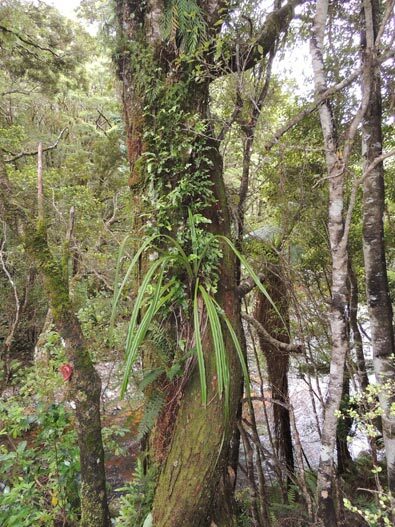 The name "wharawhara" with its derivatives denotes five species of mostly epiphytic plants, all with sheathing leaf bases and sword-shaped leaves. 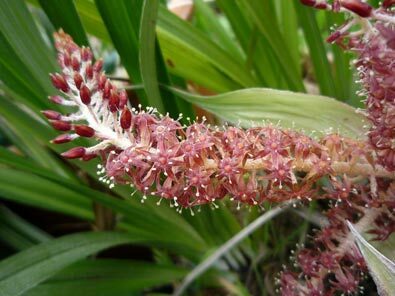 They were formerly classified botanically as belonging to two genera, Astelia and Collospermum, within the lily family (Liliaceae), but have since been re-classified, by at least some authorities, into a new plant family (Asteliaceae), and a single genus (Astelia). Collectively, along with other botanically related and not-so-closely related species marked out from other plants by their sheathing, ensiform bases, they are termed whara (see the link above). Astelias have separate male and female flower bracts. 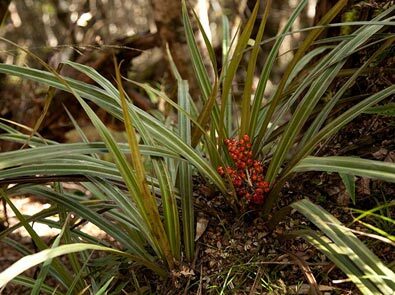 The fruits of the astelias are edible, although those of some species are not particularly palatable, and they do not seem to have been an important food source for Māori. The flower bracts, sometimes known as tāwhara (as with those of the kiekie, Freycinetia banksii) are edible at the base. (The element tā is of Proto Polynesian origin, originally meaning "a bunch of fruit, especially a hand of bananas".) When in flower, the kōwharawhara, Astelia solandri, is known as tāwharawhara. 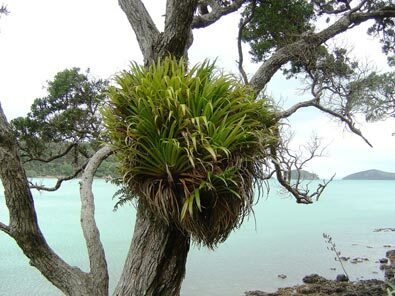 The root word wharawhara without any prefixed element refers most commonly to the saxicolous (rock-dwelling) Astelia banksii, which grows natively near the sea in the northern part of the North Island. When mature the leaves will be over a metre long. Both surfaces of the leaves are covered with scales which glisten in strong light (as in the photographs above and at the bottom of this page). 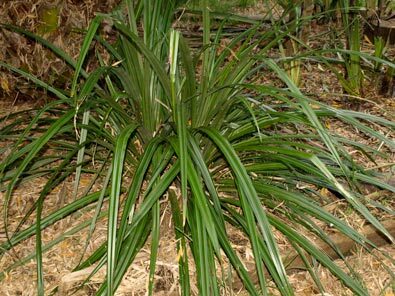 It is likely that the kahakaha, Astelia hastata (formerly Collospermum hastatum) was also referred to by this name, as well as pūwharawhara, among others. The verse from Ngā Mōteatea quoted in the poetry section of this page (below) fits best with this plant, weeping from its perch. Astelia banksii is also called pūwharawhara (clumping wharawhara), and this name has also been noted as applying to Astelia hastatum. These latter plants form huge clumps high in the branches of forest trees. The leaves can reach well over a metre in length, and are open at the bases so that, as with many bromeliads, water and leaf mould can collect there to sustain the plant. The clumps of mature plants often get so heavy that they fall off the trees and continue growing happily on the ground. They are easily distinguished from other Astelias (which otherwise they closely resemble) by their open leaf bases, wider leaves, and the dark colouring. The other name in this series, kōwharawhara, again applies to Astelia banksii (which could almost certainly have been the first Astelia encountered by the arriving Polynesians), and also denotes Astelia solandri. The latter is a strong-growing forest epiphyte which also grows on the forest floor, and has leaves between one and two-metres long. 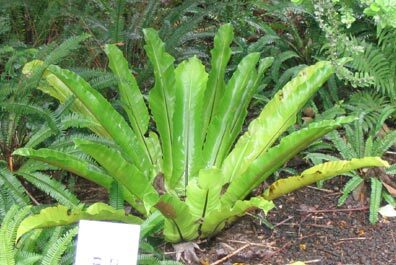 The kōwharawhara has alternative names, including kōkaha, probably from Poto-Tahitic *kōkaha, "birds nest fern" (Asplenium nidum), and kahakaha. Astelia fragrans and Astelia nervosa also share a similar name, kakaha. It is possible that, given the flax-like qualities of Astelia leaves, and the fact that they were indeed a source of fibre analogous to harakeke (but much less important), these names may be derived from the same source as Māori kaha "rope, lashings on a waka", Proto Polynesian *kafa "sennit". The cognates of kōkaha are Tahitian 'ō'aha and Tuamotuan kōkaha, both referring to the birds-nest fern, Asplenium nidus, illustrated at the bottom of this page, which has analogous habits of growth to the Astelias. Me he wai wharawhara te tūturu i āku kamo. E kakapa ana me he rau kahakaha! In the notes to this song, the kahakaha is identified as Astelia solandri. The words mauri and mauri kura ("precious mauri") denoted certain, mostly epiphytic astelias including possibly Astelia fragrans (which, however, is often ground-based), as perhaps in the quote below, and also Astelia microsperma. 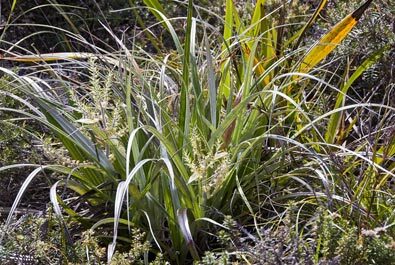 There is an interesting passage in the Māori texts appended to Elsdon Best's book Maori Agriculture in which one of these plants is mentioned, and differentiated from the wider-leaved Astelia solandri, which does not belong to this group. It is from an account of Māui's visit to another world to secure the plant as food for himself and his brothers, after seeing Pani give birth to the tubers. The account was given to Elsdon Best by Hamiora Pio of Te Teko in 1898. Pani was working in her kūmara garden, hidden away. Māui and his brothers searched for her, Māui using his dart to divine the way. Māui's dart struck home, lodged firmly in the clump of mauri where the woman had departed. Maui went that way, and found Pani working in her kūmara garden. 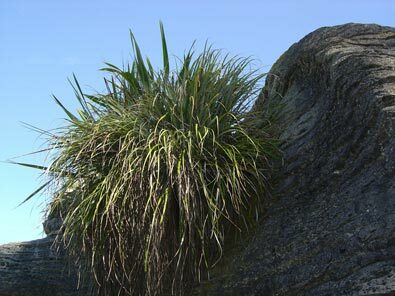 The mauri above Pani's portal between the worlds may have been Astelia fragrans, as the word used for the impact of the dart is "patu", a verb often used to denote the bruising of plants used for scent, and the leaves of this versatile plant are certainly narrower than those of Astelia solandri. The use of the word mauri to denote a group of plants is unique to Aotearoa. 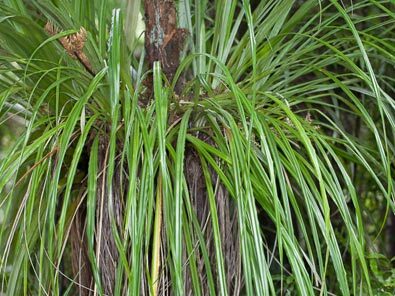 References and further reading: There is information about each species of Astelia in the NZ Plant Conservation Network's database. Murdoch Riley discusses the lore attached to these plants and their medicinal qualities in his Herbal, and Andrew Crowe has further information about them in his Field Guide to Native Edible Plants; see also the general works on NZ plants in the bibliography. Photographs: Many of the photographs on this page are used with kind permission from members of the NZ Plant Conservation Network: Wayne Bennett (Astelia solandri, A. banksii & A. hastata); Jesse Bythell (flower of A. solandri, and A. fragrans in its natural habitat); Mike Thorsen (Astelia solandri and A. nervosa); and Jeremy Rolfe (A. banksii). There is also a good photograph of the pūwharawhara (a.k.a. kahakaha, Astelia hastata, on the Wellington Botanical Society's website, with its distinctive black base clearly apparent. with the tree trunk included! Photographer will be gratefully acknowledged!